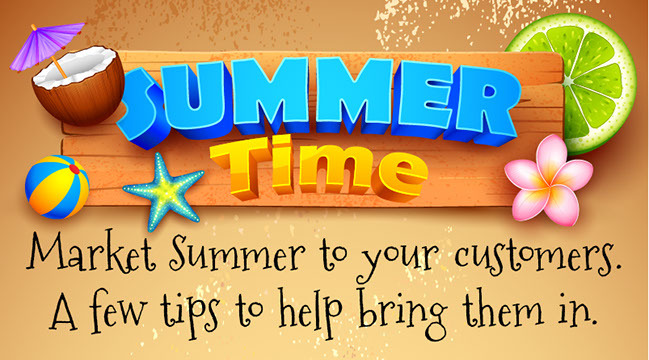 Summer is a time for fun – Take the season to emphasize fun, both with your customers and employees. Have “wear a Hawaiian shirt to work” day. Invite neighborhood children (or children of employees) to set up lemonade stands outside of your building on Friday afternoons. Be sure to capture your team members enjoying summer during the work day and post to social media. Have an outdoor event – Have an event at a nearby lake or beach, or even in your own parking lot. Offer free food and music, and hand out flyers and promotional materials. Give away prizes or services to attendees in the form of a raffle or contest. Lower Prices as the Temperature rises – Have sales like Customers receive $10 off any purchase of $100 or more when the temperature is above 100 degrees or give-away a COLD bottle of water (and air conditioning) for anyone brave enough to shop in the hot weather. Give away seasonal items – Offer a free T-shirt, Water bottle, fan, or Beach Towel branded with your company logo to customers as a reward for making a purchase, scheduling a consultation, or making an appointment. This will increase your name recognition and give your customers a nice token of your appreciation . Community Service – Organize a litter pick-up day and invite the community to pitch in. Make sure you have company branded T-Shirts or a uniform for your employees to ware, and send out flyers and promote the event on social media. Recruit volunteers and let your local newspaper or media outlet know what you’re planning to do. You’ll get great PR and help a great cause. Swimming – Give customers a one-day pass to the local pool or waterpark as a reward for their purchase. Create more fun for your customers and employees, bring in more business and get your company name out into the public. And don’t forget if you need any kinds of promotional materials to help you in your summer marketing efforts, we at Pedersen Design can provide you with top notch service and creative, captivating advertising solutions. Contact us Today, and be proud of your marketing success this summer.